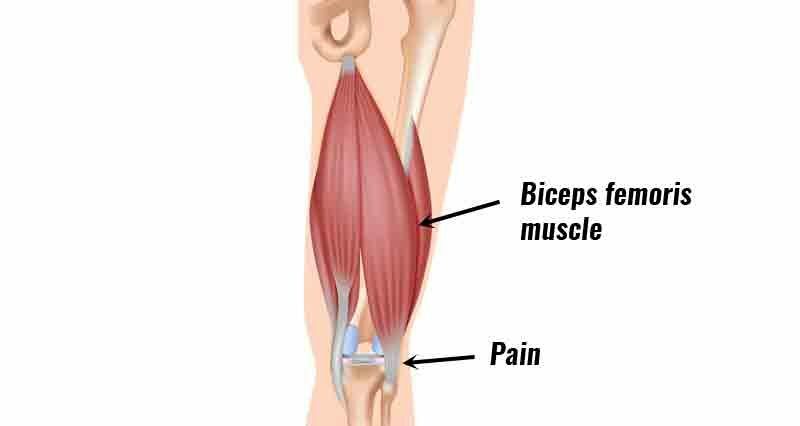 Biceps femoris tendinitis (tendinopathy) is inflammation, or more likely degeneration of the hamstring tendon at the point where it attaches to the back of the knee. Symptoms include tenderness and swelling where the tendon inserts into the bone at the outside back of the knee. Pain is likely to have come on gradually and been a ‘niggle’ or restriction that the athlete has trained through for some time. Stiffness at the back of the knee might be worse in the mornings or when sitting for long periods only for it to ease off as the tendon warms up. There may be a pain when trying to bend the knee against resistance as well as stiffness after exercise and the next day. The athlete will often have tight hamstring muscles and find toughing their toes difficult. The hamstring muscles group consists of the biceps femoris, semitendinosus and semimembranosus muscles. These muscles are used to strongly bend the knee, and extend the hip backward. A great deal of force is put through the hamstring muscles at speed when sprinting and jumping. Inflammation or degeneration of the biceps femoris tendon at the point it inserts into the tibia (shin bone) can occur from a partial rupture that has not healed properly or through overuse, particularly from accelerating and decelerating activities. Most commonly it is the biceps femoris tendon which is involved. The term tendonitis is most commonly used, however usually this is not strictly accurate. Tendonitis refers to an acute inflammation of the tendon where in actual fact unless the injury is very recent the pain is more likely due to long-term overuse and degeneration of the tendon. A broader and more accurate term for this type of tendon injury is tendinosis or tendinopathy. If the injury is recent or acute then rest and apply ice or cold therapy for 10 to 15 minutes every hour for the first 24 to 48 hours. Wear an elastic type of support to help reduce any swelling and support the knee joint. Later, once the initial acute stage has passed, or if the injury is a long-term chronic condition then applying heat and wearing a heat retainer type knee support is likely to be more beneficial. Once pain and swelling have gone, stretching and strengthening exercises can begin to restore the muscle and tendon to full fitness and make it stronger to prevent the injury recurring. A doctor may prescribe anti-inflammatory medication such as ibuprofen during the early stages to reduce pain, swelling, and inflammation although this less appropriate in the later stages of rehabilitation. Applying ultrasound or laser treatment can also help with the inflammation and healing process as can cross friction massage. A full rehabilitation program consisting of stretching and strengthening exercises should be done as soon as pain allows. Gradually increasing the load through the tendon so it can cope with normal demands of sport is the aim. Eccentric exercises where the muscle contracts as it lengthens are very beneficial in treating tendinopathies. Stretch and the muscles and restore mobility and flexibility. Rest from aggravating exercises. Avoid any form of exercise that may make the injury worse. If you are on your feet a lot at work then this will not help. You should rest until the acute stage has passed. This is usually 48 hours if you look after it. If you continue to use the tendon then it may remain acute for longer. If you can contract the hamstring muscles (bend the knee) without pain then the acute stage may have passed. Apply ice/cold therapy. At least 3 times a day for 15 minutes. NSAID (Non-Steroidal Anti-inflammatory Drugs) e.g. Ibuprofen may help reduce inflammation in the early stages. Always consult your Doctor before taking medication. Ibuprofen should not be taken if you have asthma. Wear a knee support or heat retainer. Heat may be applied after the acute stage but up until then, apply cold therapy. Hamstring stretches can be done from day one so long as they are not painful. If stretching produces pain then rest until stretching can be done without pain. Hold stretches for 30 seconds and repeat the stretch 5 times. Stretch every day (if it is pain-free). Stretching exercises should be done with the leg rotated inwards and again with the leg rotated outwards….more. Sports massage can play an important part in restoring flexibility and enhancing the healing process. Massage can begin after the initial acute stage – usually after the first 48 hours. If bending the knee is painful then avoid massage therapy until it is not. Strengthening exercises should be done to prevent the injury recurring. Strengthening exercises can begin as soon as they can be done without pain. This may be after the first 48 hours or it may be up to a week before strengthening can begin. There should be a gradual progression. Once you can cope with the easy exercises without pain during, after or the following day then move onto a more difficult exercise….more. Strengthening exercises should continue long after you feel the injury has recovered. As soon as you are confident of pain-free stretching and strengthening exercises it may be possible to begin more sports specific training. This may be within a few days or up to a couple of weeks or longer depending on severity. Gradually increase the duration of your runs. No more than 10 % per week is usually recommended. If your sport demands sprinting then gradually increase the speed of each training session so long as there are no adverse effects. Start at 50% of maximum speed and increase by about 10% per session. Continue with specific strengthening and stretching exercises. Each session should begin with a warm-up and stretch and end with a cool down and stretch. Always ensure you follow a correct warm up before training or competition. Stretch the hamstring muscles both before and after training. Stretch every day, regardless of whether you are training or not. Strengthen the muscles to cope with the demands placed on them. Have regular sports massage to keep the muscles and tendons in good condition. Biceps femoris tendon avulsion is where the tendon pulls a small piece of bone away with it. Hamstring strain is a tear to any of the hamstring muscles.